Muscovy ducks are sometimes a problem. They can form large flocks, and they poop all over everything. We do sometimes remove them, either via netting or trapping. Muscovy duck information and facts - Perhaps not all of you are familiar with the moscovey duck or scientifically known as the “cairina moschata” which is one of the native bird species of Mexico, South America as well as Central America. Generally though, especially if you are into cooking and only knows the culinary terms, this kind of animal is called a Barbary duck. This specie is also termed as a tropical breed although they are recognized for being able to adapt to icy and cold conditions of countries with winter seasons and feral populations exist in Europe as well as nearly all public parks in the entire country and some Canadian provinces. Most moscovey ducks have brownish black color but due to breeding and other cross populating the some other colors, they are now seen in different plumage and colors ranging from yellow to dull blackish colors. Some domestic varieties have black, blue or chocolate colors. There are also kinds which are mainly composed of white color and there are still a few breeds with lavender, bronze, barred and ripple colored. They are known to have long, strong claws which they put in good use to stay perched in some trees while trying to fly around. They also have a flat tail which is a little wider than normal ducks. Males and females share the same looks or appearance but they mostly differ in their sizes. Males are said to be double in size than their partners. To put it more numerically, a male domesticated drake would be around 34 inches in length and weighs about 10 – 15 pounds while the female population would only grow as large as 25 inches and would be between 6 to 8 pounds in weight. The male population of this kind of ducks is not as noisy as the regular breeds which quack all the time but rather they create a low more like hissing sound and the female is known to utter a short but weak quack. Etymologically speaking the word “moscovey” would mean “originating from Moscow” although there is no connection at all where these birds come from. But since the actual spelling is Muscovy duck, that doesn't make sense anyway. They are non-migratory specie; meaning that they do not have any migration patterns and is often sedentary. They do not fly away or move from their established habitat but are fond of just simply flying around and landing back on their supposed home. In other times though they transfer places because of the changing water conditions. These animals are mostly found in swamps, lakes, streams or any favorable location close to the water. They are also often seen perched on trees at night. They are also fond of eating any plant life that they can see and easily ingest while in shallow waters. They can also live with a diet of small fishes, crustaceans, and insects. They also feed on leaves, roots, stems and seeds from any fruit bearing trees or plants that they can find near their domicile. Behavior patterns also vary between genders. Male moscovey ducks are observed to show a more aggressive behavior. 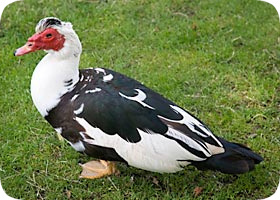 They tend to fight for food or to establish their territories among their herd as well as with selecting their mates while female muskovy ducks are more lenient and engages less in fighting. Some adults are also showing dominance over their young ones by pecking at their ducklings for sharing the same source of food. Reproduction for this breed can take place three times a year. They can either mate in land or in water and there would be about 8 to 16 eggs that are produced. You can usually find these eggs in hollows or tree holes where they are laid and incubated by females for another 35 days. Similar with other birds, the female is responsible for hatching the eggs and living with the litter for a few days since they cannot yet reproduce much body heat to warm themselves especially at night then the male can take over the responsibility and teach them how to fend for themselves. Go back to the main Bird Removal page for more information about Muscovy Duck removal.